A Smart Netbox can do all this. . . Routes traffic between two Ethernet networks and handles switching of packets between devices on the network. Fiber extends the reach of your network and provides superior noise immunity. Easily and securely access an Ethernet network from any remote location over standard telephone lines. Protects networked devices from unauthorized access, while providing secure remote and/or networked connections. With a simple firmware change, a Smart Netbox can become a Smart SoftPLC Programmable Automation Controller and/or Protocol Gateway! In a networked industrial controls environment, connecting devices like controllers, HMI's, computers, drives, I/O, robots, and serial process control equipment can often become a challenge. Demand for data exchange between sensors, I/O controllers, serial devices, switches, routers, and computers is ever increasing. Compatibility, physical space, cabling and security concerns all add to the difficulties, costs and complexities of typical networking equipment solutions. A Smart Netbox solves these challenges by combining a number of network support functions into a single industrial low-cost, physically small package. In its most basic configuration, a Smart Netbox is an industrial grade, managed Ethernet switch with both LAN and WAN interfaces to support routing functions. For simple applications, just connect power and Ethernet cables. You can power the Smart Netbox with 9 ~ 48VDC. Adding an optional* internal industrial telephone modem (Cat No SM-MDM) to the basic Smart Netbox, creates what is known as a Remote Access Switch (RAS). This allows you to connect to devices on an Ethernet network at a remote location over standard telephone lines. * Modem must be factory installed. An embedded Firewall/VPN can be added as a firmware option to any Smart product, including the Smart Netbox. 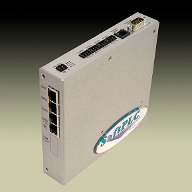 This adds high-end network security, protecting Ethernet-to-Ethernet and modem-to-Ethernet connections such as industrial network to business network, or industrial networks/devices connected to remote sites via the internet. Powerful security features block dangerous and/or unwanted communications from entering your network and restricts access to only authorized users. A Smart Netbox with an optional factory installed fiber connector can be used as a media converter, which allows two Ethernet devices with different physical media to communicate with each other. Additionally, it allows Ethernet networks to work on longer distance runs and increase surge and noise immunity. Fiber interfaces for multi-mode and single-mode, and for ST or SC connectors are available. Accessories include power supplies, connectors, etc.